There are days when the fresh scent wafting out from Pret A Manger is enough to put a smile on anyone’s face. Of course, there are also days when you don’t have time to pop into a Pret. Maybe you’re busy at work with back-to-back meetings, maybe your first born has decided to keep you up for 24 hours straight, or maybe the idea of braving the London rain is just too much for you on your day off. Not to fret. WIth Pinga you can have Pret’s food and drinks delivered to your doorstep. That’s right — no need to put on the Wellies, hat, gloves, jacket, scarves and grabbing your brolly. Instead, you can just sit back and wait for delivery. Isn’t life sweet sometimes? We think so. And we think it’s all the sweeter for community. That’s why we launched Pinga. Pinga is an app that connects people to services and services to people. Our trusted Pinga partners can help you with anything from grabbing a sandwich at Pret, to popping down to the pharmacy when you’re sick. Minor emergencies, such as having forgotten to buy dessert, or, low and behold: coffee, can easily be avoided thanks to Pinga. With Pinga, there is no need to buy half of the items in a Pret A Manger shop to qualify for an order. Whether you want one coffee, or fifteen muffins, one of the Pinga partners will be able to help. Just put out a request and someone will reply. Pinga delivers any items from Pret A Manger today. 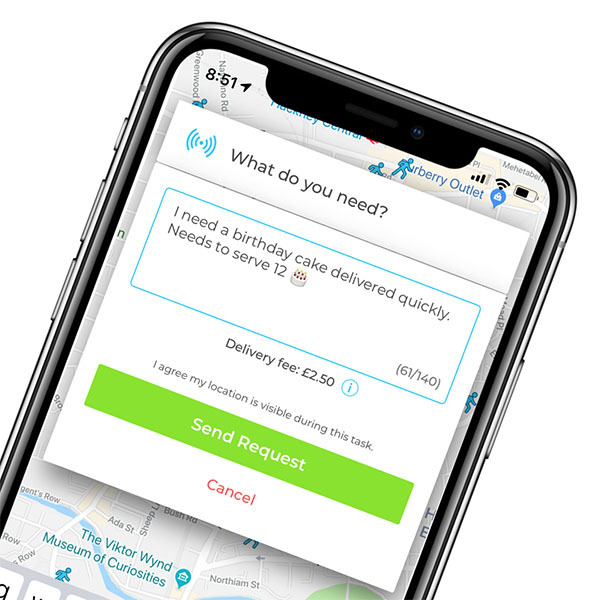 Infact our service normally delivers within an hour, so if you’re looking for same day delivers from Pret A Manger, send your request via the Pinga App. Describe what items you needs to be delivered from Pret A Manger and send your request. Pay securely within the app and receive your Pret A Manger items to your door!